AMHERST, Mass. - No. 1 University of Massachusetts opened Friday night's game against No. 8 Northeastern with a 3-0 lead and never looked back, rolling to a 6-1 victory at the Mullins Center for the squad's 10th Hockey East win of the season (10-1-0). The Minutemen improve to 18-3-0 overall, while the Huskies drop to 14-5-1 and 8-3-1 in league action. "Tonight was obviously a marquee game with two top-10 teams and a lot of attention," said UMass head coach Greg Carvel. "I could tell my team was going to be ready to play and I thought that was as well as we've played all year. We made the game extremely difficult on Northeastern with our positioning and I thought we dominated the game. It got a little unraveled there at the end there when they took the five-minute penalty and we did some foolish stuff. But outside of that, we executed our game plan very well, we played very disciplined and we scored a lot of goals around the net, which is a great sign. In a game that a lot of people were focusing on us to see what we would do, we were extremely good." The Minutemen set the tone of the evening by scoring just 90 seconds into the first period. Senior Kurt Keats redirected in a shot from sophomore Mario Ferraro and Ty Farmer at the points for his first of the season. Midway through the stanza, senior Jacob Pritchard made quick work of UMass' first power play chance of the night, taking the puck from freshman Bobby Trivigno and sophomore Cale Makar and driving to the net for his 10th of the year at the 9:53 mark. Senior Brett Boeing then made it a 3-0 margin, connecting with a crisp headman pass from Makar and backhanded home a shot that found its way to the back of the Northeastern net 13:16 into the period. At the 8:37 mark of the second period, freshman Ty Farmer found sophomore Oliver Chau at the doorstep for his third in as many games. Sophomore Mitchell Chaffee collected an assist on the play, as well. The lead stretched to 5-0 with the Minutemen's second power-play goal of the contest 9:48 into the second. After receiving the puck from Pritchard, Makar set up Trivigno for a redirection. 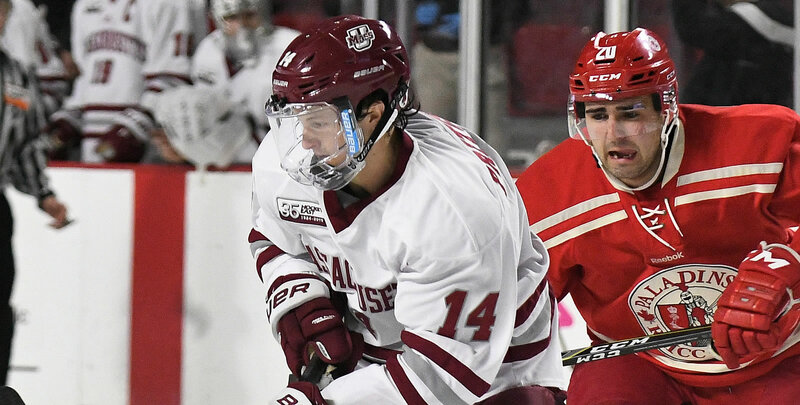 Sophomore Philip Lagunov netted the sixth and final UMass tally 19 seconds into the third, driving to the net for the score from Trivigno and Pritchard. Tyler Madden broke up the shutout bid, collecting Northeastern's only goal of the evening on a 4-on-3 power play at 8:45 in the final stanza. The Minutemen finished the contest with a 38-16 shot advantage and went 2-for-5 on the power play, while the Huskies were 1-for-3. Trivigno's goal and two assists marked a new season best for the freshman and his fourth multi-point game of the year. Pritchard equaled his season high of three points with his goal and two helpers, his ninth multi-point game and fourth in the past six contests. Makar, the reigning Hockey East Defensive Player of the Week, followed up last Saturday's four-point performance with a career single-game best three assists, his seventh mutli-point game of the season. Sophomore Matt Murray improved to 15-1-0 with the win and made 11 saves in 47:51 minutes. Northeastern starter Cayden Primeau had 17 stops and was relieved after 29:48 minutes of action. The teams will conclude their weekend series in Boston tomorrow night at 7 p.m. in Matthews Arena.